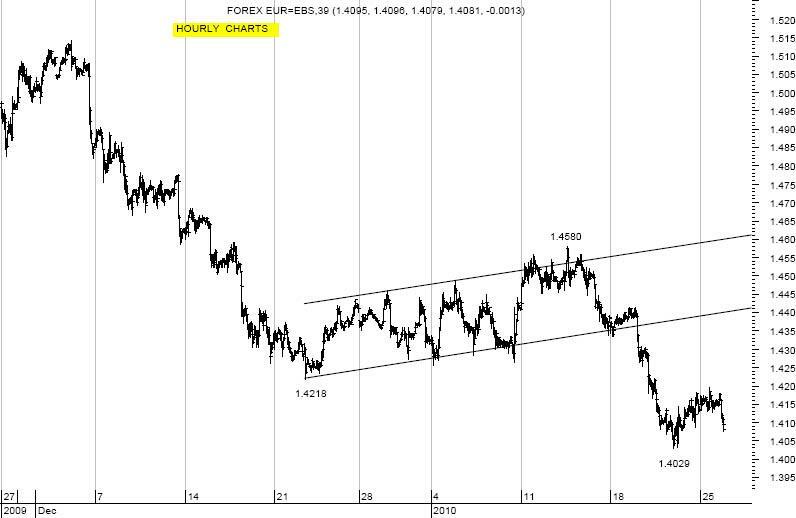 Drop from 1.4580 puts the pair below the bearish Flag off 1.4218 (see graph). Support area at 1.4066/ .4063 (break-up hourly/ daily envelope bottom), with next levels at 1.4048/ .4046 (daily Bollinger bottom/ weekly envelope bottom, where pause favored. If wrong, next levels at 1.4029/ .4007 (current reaction low off 1.5145/ Fibonacci Fan Line on weekly charts + 5th hourly off 1.4580 ): tough on 1st tests. Resistance at 1.4158 (breakdown hourly), with next levels at 1.4195 (current week high), ahead of 1.4220/ .4239 (idem/ 38.2% 1.4580 to 1.4029), where pause favored. If wrong, next levels at 1.4252/ .4266 (breakdown daily/ hourly), ahead of 1.4300/.4311 (weekly envelope top/ broken 50 Day Moving Average↑) and 1.4327 (daily Medium Term Moving Average↓): must sustain back above to call end on alert on €.